The essential idea is that you connect the Edge to a computer, wait for it to be mounted, and then copy files from the device to a backup location. Safely store these backup copies in case something becomes FUBAR. 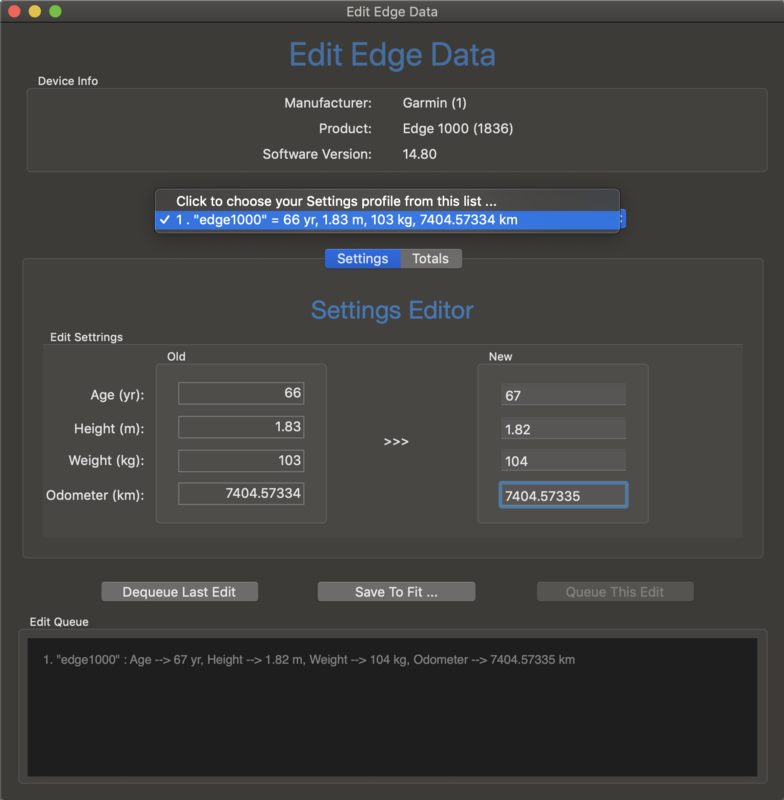 Use Edit Edge Data at your own risk, the App is provided on as "AS IS" basis only. The Settings Editor changes age, height, weight and odometer values. 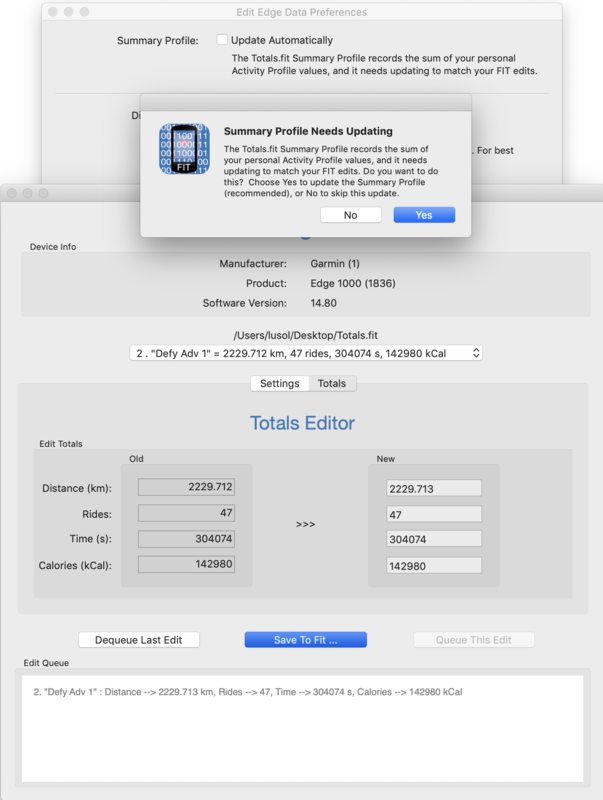 The Totals Editor targets a specific Activity Profile and changes profile distance, ride count, ride time and calories. Locations.fit file that stores saved locations. Records.fit file that stores personal records you have achieved. Sports folder that contains each activity profile as a separate FIT file. Weight.fit files obtained from a Tanita platform. Use the Finder and click to Edge 1000 → Garmin. Use the Terminal command line and cd /Volumes/Edge\ 1000/Garmin. If you haven't done so already, make a backup copy the target FIT file, as described in the Disclaimer section. Because that's a backup, now make a second copy of the file - the version that you will actually edit! Trust me on this. 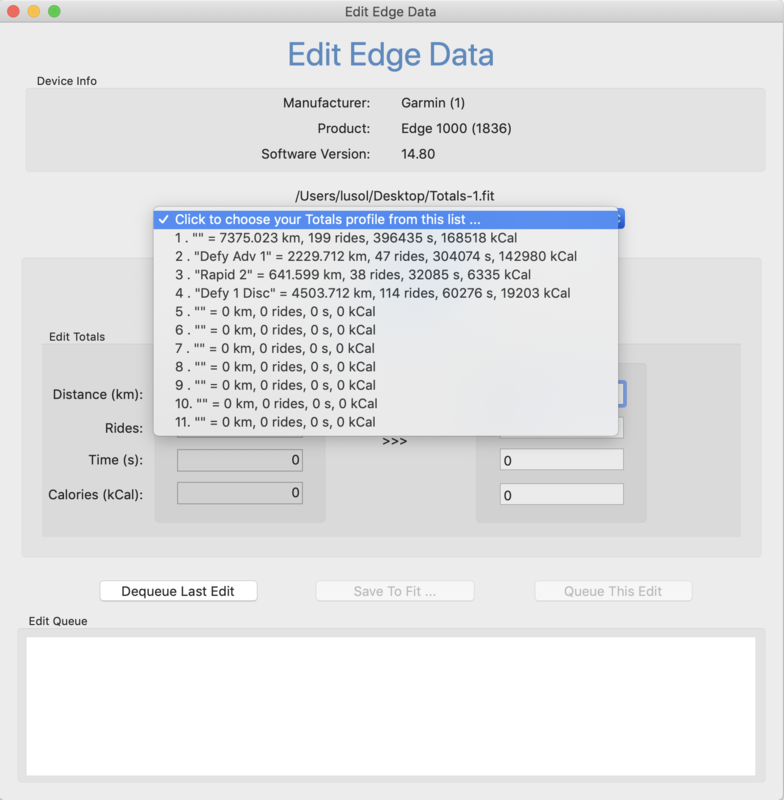 Run Edit Edge Data and click File → Open FIT ... to open the desired FIT file. Select a profile from the popup menu, make your changes, and click Queue This Edit. You can make multiple changes which are queued for later processing. Use File → Save To FIT ... to save the FIT to yet another file. During the save operation the edit queue of modifications is applied, on-the-fly. Copy the edited FIT to the Edge 1000 → Garmin → NewFiles folder and rename it to its original name. Eject the Edge 1000 and disconnect the USB cable. Restart the Edge 1000. During startup files in the NewFiles folder are copied to their proper destinations and installed. You should see your changes on the device. The Edge bike computer has one odometer that tracks the total distance the device has traveled, and which you can see by touching History → Totals → Device Totals. This information is kept in the file Totals.fit. (Oddly, there is another odometer distance in the file Settings.fit, whose function is currently unkown; use the Settings Editor to edit that field if you find the need.) Additionally, the Edge tracks total ride count, total ride time and total calories. But having just a device total for this data is problematic for folks who have multiple bicycles and want to tally distance / rides / time / calories on a per-bike basis. The typical work-around is to create an Activity Profile for each bike to individually tablulate this information. Thus, as long as you remember to select the profile corresponding to the bike you are riding, distance / rides / time / calories per bike is accurate. The device totals profile, called the Summary Profile, is stored in profile slot one, with your personal activity profiles stored sequentially starting at slot two. This is the order that the profiles are listed in the profile selector popup menu. Now let's look at a concrete example. Suppose that Alice, who was running late for a group ride, forgot to set her Edge 1000 activity profile to match the bike she was riding that day. It was only after the ride that she realized there were an extra 100 metric-century-kilometers on her mountain bike that should really be on her road bike. Here is how Alice recovers from that mistake. She connects her Edge 1000 via the Garmin-supplied USB cable to her iMac and uses the Finder to illuminate the full path to Totals.fit. She duplicates Totals.fit somewhere that's convenient to edit, perhaps Desktop. This will be the input file to Edit Edge Data. 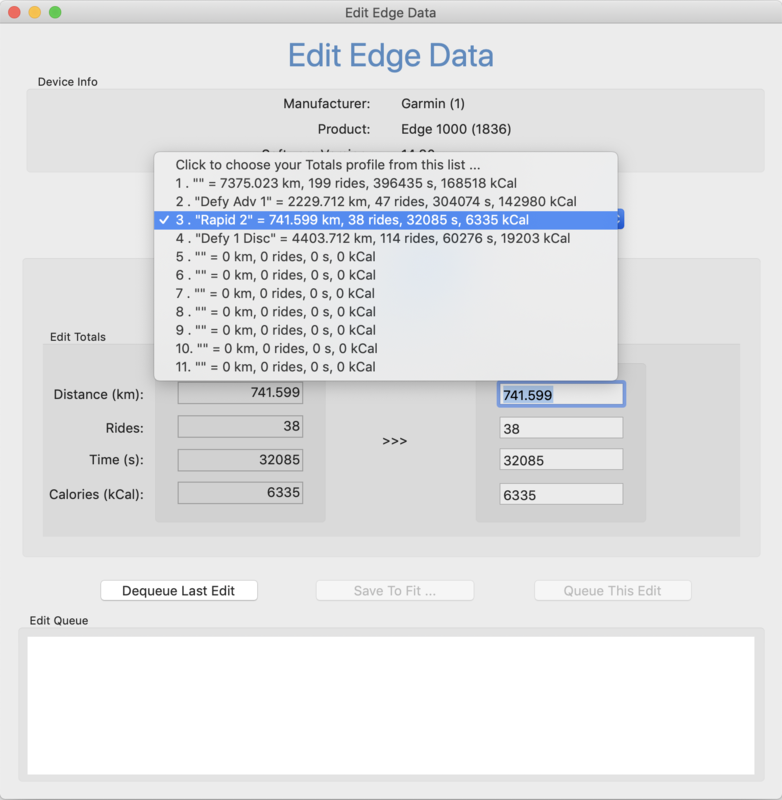 She runs Edit Edge Data and selects the Totals Editor from the row of Editor tabs, then clicks File → Open FIT ... to choose ~/Desktop/Totals.fit. When she clicks the App's pulldown button she sees her three bike profiles and the distance traveled by each bike. Notice the distances are in kilometers, but that's a Preference option - you may use miles if desired. So the task at hand is to subtract 100 kilometers from bike profile #3 (the mountain bike) and add 100 kilometers to profile #4 (the road bike). Alice grabs her iPhone and uses her favorite calculator App ( GO-21 SciRPN, available on the iOS App Store  ) to compute 741.599 - 100 = 641.599 km and 4403.713 + 100 = 4503.713 km. To make those two edits she first selects bike profile #3, makes the distance change, then clicks Queue This Edit. She repeats the procedure for bike profile #4, resulting in this. Notice the Edit Queue has two entries and the Save To FIT ... button is enabled. She clicks Save To FIT ..., which asks for a filename (perhaps Totals-1.fit), then processes the edit queue and writes the new output file. To double-check the results, Alice opens the new FIT file and sees that, indeed, her distances are back in synch. Lasty, Alice needs to install the new FIT onto her Edge 1000. 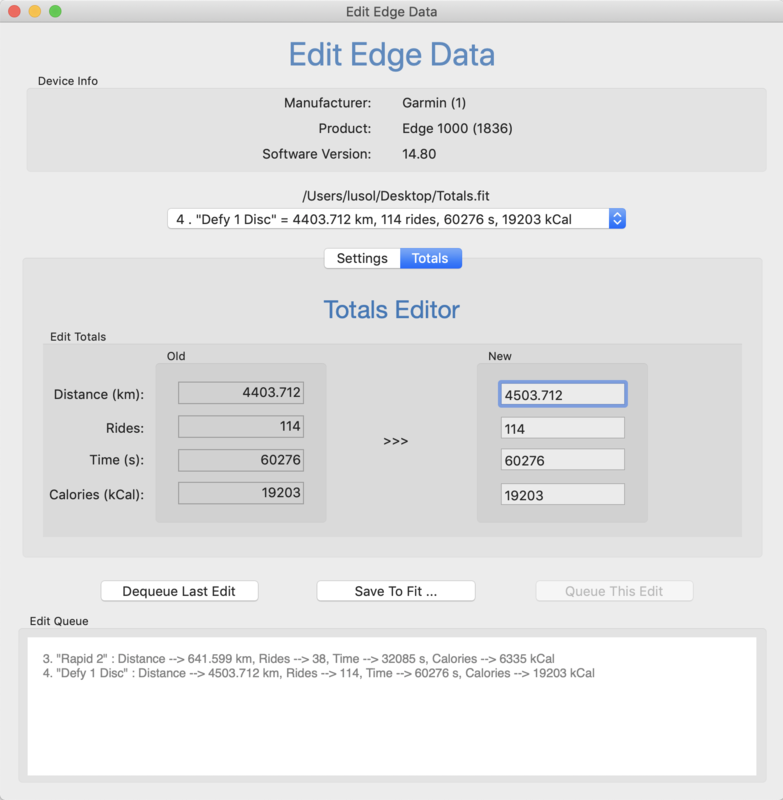 She does this by dragging Totals-1.fit to Edge 1000 → Garmin → NewFiles → Totals.fit. IMPORTANT: the filename must be Totals.fit, not Totals-1.fit. Eject the Edge 1000 and disconnect the USB cable. Restart the Edge 1000. Fini. Admittedly, the previous example was contrived, it was designed for simplicity and to illustrate essential Edge Editor concepts. For instance, Alice only adjusted bike distance and failed to even consider changing ride time. But more importantly, the device totals stored in the Summary Profile remained the same because there was a symmetric change in two activity profiles - adding 100 km to one profile and subtracting 100 km from another did not change the overall device distance. Many thanks to Kiyokazu SUTO suto@ks-and-ks.ne.jp for his fantastically thorough Perl modules that manipulate FIT bits.